This was AMAZINGLY delicious (if you like tangy lemon). 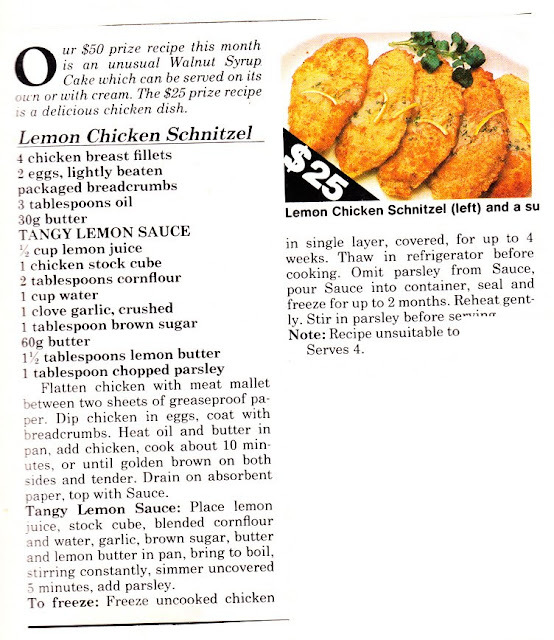 I'd say this recipe came from the Women's Weekly... how nerdy that I recognise their recipe font!! I didn't bother to crumb my own chicken - that's what the Mad Butcher is for. The sauce recipe is perfect if made according to the recipe. It's not as sweet as some of the ingredients suggest. This recipe makes bucketloads of sauce. I reckon you could get six servings from it. I have a feeling if you freeze it that it will curdle when it defrosts, so only make as much sauce as you need. Or make extra and put it in some Tupperware for your friends. That looks delicious! I need something new to do with my chicken, and this just may be the answer! Carissa, I hope you like this recipe! I remember Mum making this one when I was little. It's retro hahaha! i'm not allowed crumbed chicken... or probably brown sugar, though. I couple probably make it without crumbs, i guess.